Thus I bring to you the vegan Oreo Cookie Cookie. I didn’t realize Oreos were vegan until twoish years ago. I was in Pittsburgh for the annual bicycle cooperative conference Bike-Bike, drunk off my arse (we’d done a flaming drink demo in the living room earlier) and lamenting the presence of mostly cheesetastic goodies on the dining room table. Then, because I was drunk and reading everything, I picked up the package of Oreos, read the ingredients, and then screech-whooped out of joy: vegan! It was a good night. Now I don’t understand *why* they’re vegan, the Kroger brand ones aren’t, but I’ll take it. Sometimes bad junk food happens to good people. And that’s what you call a good thing (take that Martha Stewart). So the other week when Baking Bites (I think it was Baking Bites…?) posted a link to Sugar Cooking’s Oreo Cookie Cookies I knew I had to make them, and quick. I mean, it’s wrong, totally wrong, to make a cookie out of cookies. The sugar content in these puppies is ridiculous (I haven’t dared to calculate it yet). But the result? Oh my lord the result. So chocolatey they’ll put any craving to rest, these cookies are moist and chewy and crunchy and soft and, dare I say, perfection. Even my mother, the ultimate cookie-in-cookie skeptic claimed they were delicious. I recommend eating them fresh out of the oven with a glass of soy milk. Yup, they’re that classic. In a medium bowl, cream together the melted Earth Balance, brown sugar and white sugar until well blended. Beat in the vanilla and applesauce until light and creamy. Mix in the sifted ingredients until just blended. Stir in the chocolate chips by hand using a wooden spoon. Drop cookie dough in 1-2 tbsp balls onto the baking sheet. It IS amazing (and glorious!) that oreos are vegan. Newman’s Own oreos are awesome! I’m definitely going to try those tomorrow! Thanks! These look amazing! Sometimes Vegan desserts are full of scary things so I really appreciate this recipe, thanks! sweet awesomeness! i freaked out when i found out oreos were vegan, too. w00t! a good day, indeed! you make a mean look’n (and super delicious) cookie, Jes! we’ve got a party to attend this weekend and i think everyone would love ‘em! mmmmmmmmmmm! Making cookies from Oreo cookies DOES seem wrong (although I make Oreo ice cream), but that doesn’t mean I’m not going to try it the next time I have a party! Oh, you are so bad, Jes, you’re ‘good! How is it possible Oreos are vegan?! Don’t the transfats count? Ah well, sometimes it’s fun to throw caution to the wind! oh these sound soooo good! sometimes i’m glad UK oreos are not vegan because otherwise i would make those and eat the whole batch! How can I not be able to buy a package of vegan Oreos without having to shell out enough money to feed my entire family for a week when such divine concoctions are invented ?????? I’ll go and cry a little in my pillow but not before I tell you what a genius you are and after licking the monitor once more…..
Oh no! Does Germany not have an equivalent? Any chocolate cookie crumbled into the recipe would bring about the same results I bet! haha… oh jes… as if you weren’t already my hero…. Oh my god, I have a problem laying off the oreos as it is, and you had to go and make them even MORE addictive?! These cookies are pure evil. Pure, delicious, evil. OMG! You’re giving me a heart attack! These are BRILLIANT! I have always love Oreos! I made a similar cookie before (from Celine?) and everyone went crazy for them. Yours look extra decadent! Hey! These cookies look so fun! I never thought of oreo cookies in my cookies! How does it get better then that? Those look so good. I am on a cookie hiatus at the moment but adding these to the list. Holy Lord, that sounds good! 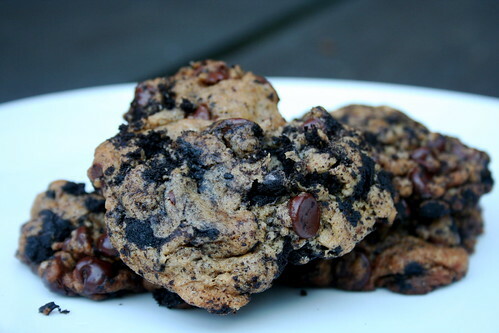 I think you could also call these “mixed soil cookies” and bring them to a geology party. They look funny! While not having had the pleasure of eating the cookies, I did snag some of the leftover cookie dough out of Jes’s fridge last week. As is always the case with Jes’s deserts, I nearly went into shock from the combination of massive quantities of sweet and awesome. I’m only hoping that I get to try the fully baked version before she leaves Atlanta behind for greener (more mountainous/more redneck-y) pastures. Holy crap – is it legal to make cookies with cookies? Seriously, yum!